Volume 1 / Issue 1 Our news! WOW! We have bought a Printmaker! Looking for a great Christmas present? – our cotton bags are beautiful, sentimental (to us -as you will help us fund our Arts for Wellbeing sessions) and useful. Our aim is to promote freedom of artistic expression, enhance social inclusion and wellbeing. Out of twelve councillors we have asked four have replied and offered to sponsor sessions, new guidelines stipulate the Councillors Initiative Fund must be spent for the benefit of the people in their particular ward. 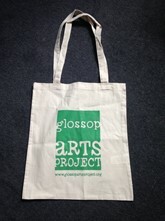 As Glossop Arts Project offers its services throughout Glossopdale it covers all wards, and has participants from all over the area so it meets the criteria. We are hoping to hear from more Councillors soon. 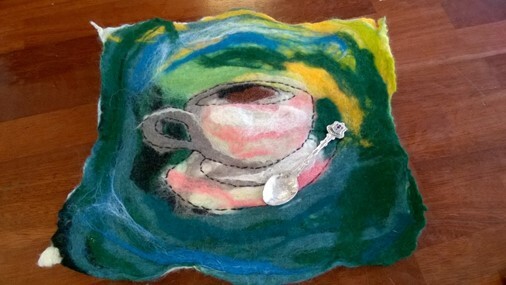 We have been working in collaboration with High Peak Community Arts and have started a four session Art Afternoon with the residents and their relatives in Whitfield House Extra Care Housing. Our Intergenerational project brings the Art students from Glossopdale Community College together with the elders at the complex. Whitfield House is a beautiful building and we are grateful to South Yorkshire Housing Association for allowing us to use a communal room for the project. We have looked at Autumnal themes in November (although on the day we were there it snowed!) we will make Christmas decorations and cards in December. Our theme for January will be snow and ice going into February hoping for some Spring flowers like snowdrops.